Mary Mattingly’s art practice collapses boundaries between performance, sculpture, architecture, and documentation. Her work addresses the need for humans to migrate due to current and future environmental and political situations. In 2009 Mary Mattingly launched Waterpod, a 3,000-square-foot experimental platform for art and community living. 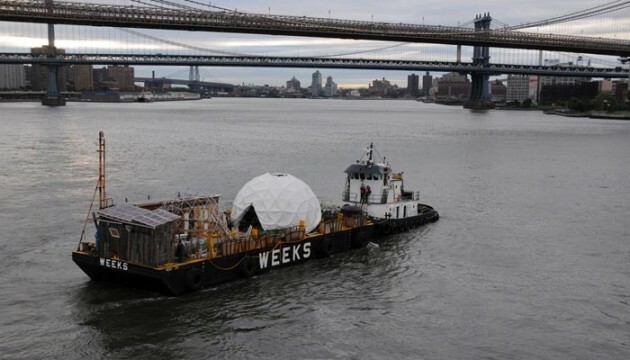 The Waterpod was designed as an autonomous marine-based habitat and as an interactive public space that could be recreated in the future, when terrestrial resources might be scarce. The goals of the project were to illustrate a future of coping with rising sea levels and lack of land-based resources, to research and develop sustainable living systems, and to foster new forms of community-based gathering spaces. Built atop a 99 x 31 foot industrial flat-deck shipping barge, Waterpod was constructed from donations and recyclables. It showcased a wide range of solutions-based technologies involving energy, agriculture, water treatment, nutrition, and marine navigation: its systems ran on solar power; its crew grew its own greens and collected its own rainwater. Waterpod was the product of the collaboration of a multinational team of artists, designers, builders, civic activists, scientists, environmentalists, and marine engineers, brought together to propose a pathway to sustainable survival, mobility, and community building. It docked in all five of New York City’s boroughs, hosting close to 200,000 visitors on its voyage lasting from June to October 2009. Mary Mattingly is an artist based in New York. She is currently a fellow at Eyebeam Art and Technology Center (NYC) and a resident at the Marie Walsh Sharpe Foundation (NYC). Her work has been featured in Art Forum, the New York Times, the New Yorker, the Financial Times, Le Monde Magazine, ICON, The Brooklyn Paper, Aperture, BBC News, MSNBC, Fox 5, WNBC, and shown both nationally and internationally.